Small Form Factor PCs (techies just say "SFF"), are compact and diminutive little systems that hardly take up any room, often look more elegant than full desktop PCs, and are easily transported too and fro. Of course small formfactor PC's are best where there are obvious space limitations, because of the inherent quantity of hardware that can be installed. Still, if you've been skeptical in the past you should know that for most applications, and in particular home multimedia or standard old web surfing and office tasks, SFF PC's fit the bill very nicely indeed. AOpen's 'mac' Mini SFF system is one of the best examples of just how small these kinds of computers can get, many operating like super-condensed notebooks. MSI Computer has come out with a small form factor PC that is a little bit bigger than the AOpen 'mac' Mini, and that extra space is put to good use - it can handle a full sized PCI Express videocard, top of the line Intel processor, regular desktop DDR-2 RAM and a couple of drives too. MSI Computer is a pretty creative small form factor PC manufacturer considering its main business is motherboards, and we like the fact that it has dropped the conventional design for something more radical. The snow white MSI MEGA mPC doesn't really look like a computer, and it's hard to identify it at first glance as one. While computer geeks might like seeing PC's everywhere, most people think computers are ugly. MSI's new MEGA mPC945 SFF PC is definitely one of these unique looking machines, and it fits right on a book shelf or at the top of a home theatre pyramid. Installation Guide, Driver CD, heatsink, 802.11b/g antenna, CPU installation tool, Power Cord. The MSI MEGA mPC945 system is based around the Intel 945G and Intel ICH7 chipsets and is compatible with all Socket 775 Intel Pentium 4/D/XE and Celeron processors running on a 1066/800/533MHz front side bus. It is not compatible with Core 2 Duo CPUs however. Under the glossy white hood, the mPC 945's two DDR2 memory slots will support up to 2GB of dual channel DDR2-533/667 memory. 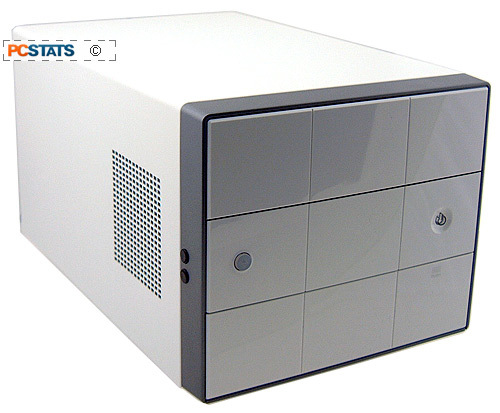 In terms of storage space, the system has one 3GB/s Serial ATA II channel and one IDE controller. There is onboard video care of the integrated Intel GMA950 graphics card, it comes part and parcel with the Intel 945G chipset. If you want to use a better videocard the system will accommodate single or double slot PCI Express graphics card. PCSTATS would advise a Geforce 7800GTX or equivalent videocard if you plan on doing any gaming at all... as you'll see in the benchmarks. The MSI Mega mPC 945 barebones system includes such features as high definition Intel Azalia 7.1 channel audio, Gigabit networking, front mounted 7-in-1 media card reader, and a 802.11b/g Wireless LAN miniPCI network card with rear mounted dipole antenna. Peripheral expansion possibilities include a PCI Express x16 slot, PCI and miniPCI slots. 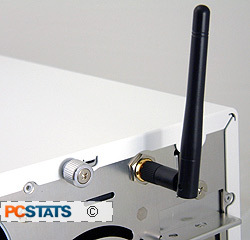 The unit PCSTATS tested came with a miniPCI 802.11b/g wireless networking card installed. All of this goes for a quite reasonable retail price of $290 CDN ($260 US, £142). Drive expansion is somewhat limited as the MSI MEGA mPC 945 system has just one internal 3.5" drive bay and one 5.25" bay - that's it. Notably missing is space for a floppy drive... but perhaps the designers figured that a collection of flash memory media readers was all that was really required in this day and age. The chassis has been designed so installing drives is a tool free affair, a rarity for SFF PC chassis, and a nice treat. The MSI MEGA mPC 945 comes with a custom heatsink for the Intel socket 775 processor, and there is no choice but to use this heatsink. Standard Socket 775 heatsinks are not compatible. Aside from the 60mm power supply exhaust fan, there is also an 80mm system exhaust fan for expelling hot air out the back of the all-aluminum chassis. All fans inside the MEGA mPC 945 are temperature controlled, and during low loads the system is extremely quiet. The power supply is rated for 260W, and should be sufficient for all that the MSI Mega mPC945 can accommodate. The rear I/O panel as various jack sensing audio inputs/outputs, PS/2, a serial port, analog video connection, SP/DIF optical audio out, four USB2.0 ports and one 10/1000 Ethernet jack. There must be a limitless number of external USB devices on the market, and the MSI MEGA mPC 945 is ready for just about anything. There are a total of six USB 2.0 slots, two on the front, four on the back. It has two IEEE 1394a Firewire ports (full sized, and mini) at the front, as well as a full compliment of 7.1 channel audio jacks, optical audio outputs, and the aforementioned integrated Intel GMA950 videocard.